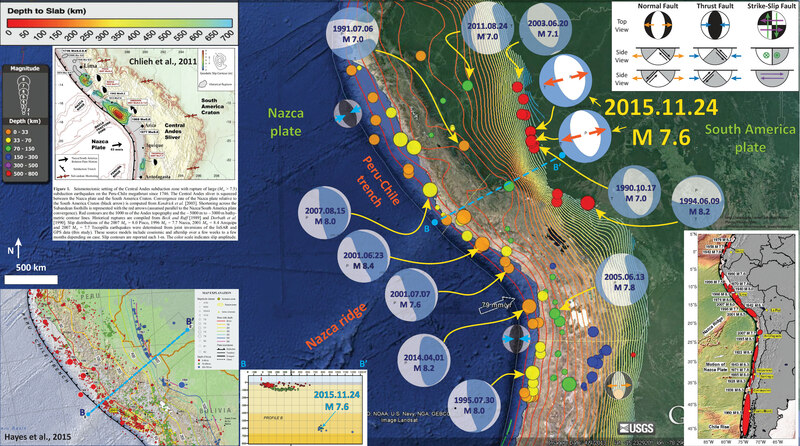 A couple days ago there was a deep focus earthquake in the downgoing Nazca plate deep beneath Bolivia. This earthquake has an hypocentral depth of 562 km (~350 miles). We are still unsure what causes an earthquake at such great a depth. The majority of earthquakes happen at shallower depths, caused largely by the frictional between differently moving plates or crustal blocks (where earth materials like the crust behave with brittle behavior and not elastic behavior). Some of these shallow earthquakes are also due to internal deformation within plates or crustal blocks. As plates dive into the Earth at subduction zones, they undergo a variety of changes (temperature, pressure, stress). However, because people cannot directly observe what is happening at these depths, we must rely on inferences, laboratory analogs, and other indirect methods to estimate what is going on. So, we don’t really know what causes earthquakes at the depth of this Bolivia M 6.8 earthquake. Below is a review of possible explanations as provided by Thorne Lay (UC Santa Cruz) in an interview in response to the 2013 M 8.3 Okhotsk Earthquake. There are lots of examples in this region of South America for deep earthquakes. They are all extensional (normal fault) earthquakes. One option could be “fluid-assisted faulting,” in which water is released from minerals as they change phases during faulting, thus lubricating the plates, Lay says. But although this is a common mechanism for earthquakes between 70 and 400 kilometers deep, it’s unlikely to be the cause of this quake because the plate is significantly dewatered by the time it reaches 400 kilometers deep. Minerals releasing carbon dioxide as they are compacted could provide an alternative fluid to lubricate the fault, he says, much like water does at shallower depths. And another possibility is that a transition in mineral form from low-pressure polymorphs (the form in which a mineral is stable at the surface) to high-pressure polymorphs (a denser form of a mineral that is stable at greater depths), gives the fault a start. According to this model, the plate subducts too quickly for the mineral to slowly transition to its denser form. The mineral will reach depths greater than where it is normally stable, and thus the transformation may be a catastrophic process, causing a jolt at 600 kilometers, which would allow for movement along the fault, Lay says. There have been a number of deep earthquakes globally in the past several years. 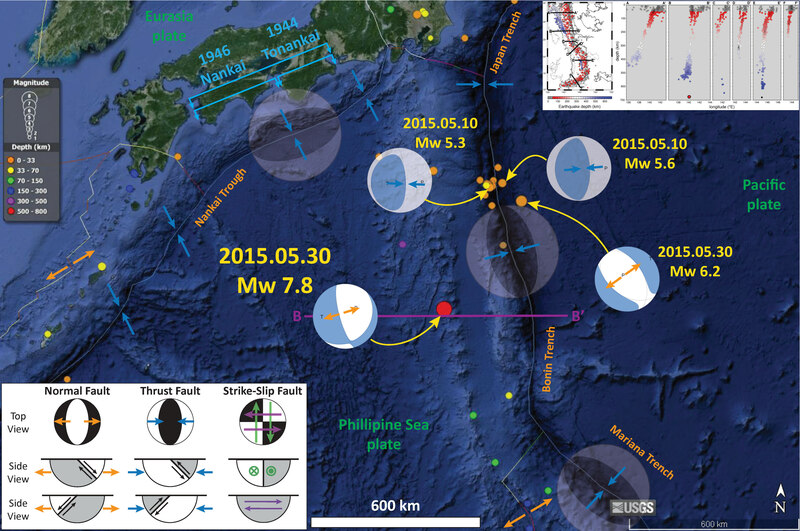 These include the 2013 M 8.3 in the Sea of Okhtosk, the 2015 M 7.8 along the Izu-Bonin Arc, and several along the central Andes. I present some interpretive posters for these earthquakes below. I plot the seismicity from the past month, with color representing depth and diameter representing magnitude (see legend). I include earthquake epicenters from 1918-2018 with magnitudes M ≥ 6.5. I include the magnetic anomaly data (EMAG2) which helps reveal the structure of the Nazca plate. In the upper right corner is a plate tectonic map from Hu et al. (2016), which shows the major plate boundaries in the region. The subduction zone is indicated as a black line with triangles (the triangles show the direction that the Nazca plate is subducting below the South America plate). I place a cyan star in the general location of this M 6.8 earthquake (as in other figures). In the upper left corner is a part of the map from Hayes et al. (2015) that shows historic seismicity. 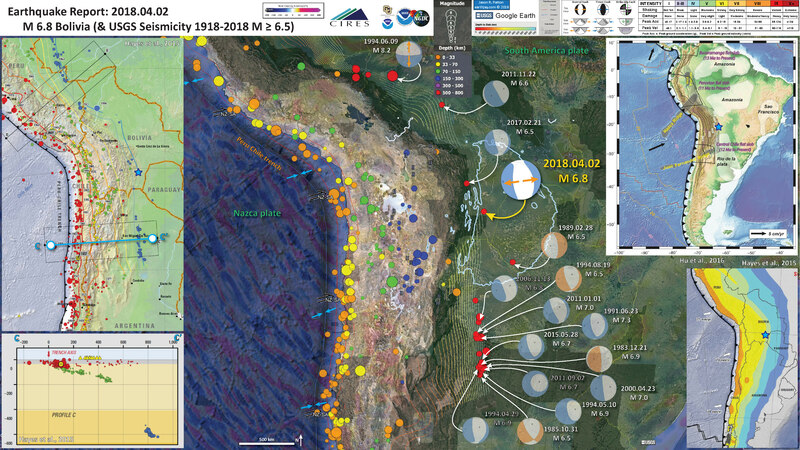 Below the map is a cross section showing seismicity. This is the cross section C-C’ shown on the map above in cyan. In the lower right corner is part of the seismic hazard map for South America (Hayes et al., 2015). Color represents the relative amount of shaking a location may experience in the next 50 years (“10% in 50 years peak acceleration”). Yellow areas may experience 1.6-3.2 m/s^2 (gravity is 9.8 m/s^2). Green may experience between 0.8-1.6 m/s^2. Here is my interpretive poster for the 2015 Izu Bonin earthquake (click here for the report). The Goes et al. (2017) paper presents an excellent review of the various forces and earthquake types along subduction zones globally. This paper is open source and free to download. Below are some summary figures. This shows the general relations between various forces exerted on a subducting slab. Schematic diagram showing the main forces that affect how slabs interact with the transition zone. The slab sinks driven by its negative thermal buoyancy (white filled arrows). Sinking is resisted by viscous drag in the mantle (black arrows) and the frictional/viscous coupling between the subducting and upper plate (pink arrows). To be able to sink, the slab must bend at the trench. This bending is resisted by slab strength (curved green arrow). The amount the slab needs to bend depends on whether the trench is able to retreat, a process driven by the downward force of the slab and resisted (double green arrow) by upper-plate strength and mantle drag (black arrows) below the upper plate. At the transition from ringwoodite to the postspinel phases of bridgmanite and magnesiowüstite (rg – bm + mw), which marks the interface between the upper and lower mantle, the slab’s further sinking is hampered by increased viscous resistance (thick black arrows) as well as the deepening of the endothermic phase transition in the cold slab, which adds positive buoyancy (open white arrow) to the slab. By contrast, the shallowing of exothermic phase transition from olivine to wadsleyite (ol-wd) adds an additional driving force (downward open white arrow), unless it is kinetically delayed in the cold core of the slab (dashed green line), in which case it diminishes the driving force. Phase transitions in the crustal part of the slab (not shown) will additionally affect slab buoyancy. Buckling of the slab in response to the increased sinking resistance at the upper-lower mantle boundary is again resisted by slab strength. Here is a plot showing their summary of observations for various subduction zones globally. Chlieh et al., 2011. Interseismic coupling and seismic potential along the Central Andes subduction zone, Journal of Geophysical Research, v. 116, B12405, 21 p.
Goes, S., Agrusta, R., van Hunen, J., and Garel, F., 2017. 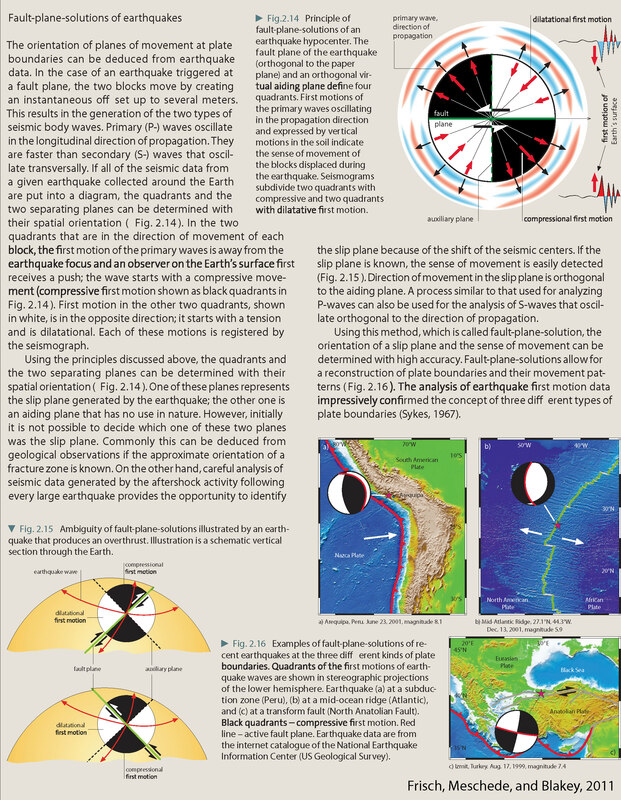 Subduction-transition zone interaction: A review: Geosphere, v. 13, no. 3, p. 1–21, doi:10.1130/GES01476.1. Kirby, S.H., Okal, E.A., and Engdahl, E.R., 1995. The 9 June 94 Bolivian deep earthquake: An exceptional event in an extraordinary subduction zone in Geophysical Research Letters, v. 22, no. 16, p. 2233-2236. Silver., P.G., Beck, S.L., Wallace, T.C., Meade, C., Myers, S.C., James, D.E., and Kuehnel, R., 1995. Rupture Characteristics of the Deep Bolivian Earthquake of 9 June 1994 and the Mechanism of Deep-Focus Earthquakes in Science, v. 268, p. 69-73. Trabant, C., A. R. Hutko, M. Bahavar, R. Karstens, T. Ahern, and R. Aster, 2012. Data Products at the IRIS DMC: Stepping Stones for Research and Other Applications, Seismological Research Letters, 83(5), 846–854, doi:10.1785/0220120032. Zhan, Z., Kanamori, H., Tsai, V.C., Helmberger, D.V., and Wei, S., 2014. Rupture complexity of the 1994 Bolivia and 2013 Sea of Okhotsk deep earthquakes in Earth and Planetary Science Letters, v. 385, p. 89-96.